For his second animated feature as director, Hayao Miyazaki adapted his own best-selling manga to make this epic masterpiece. 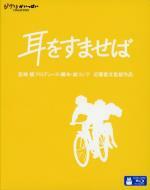 A huge success when released in Japan back in 1984. NAUSICAÄ OF THE VALLEY OF THE WIND helped launch Studio Ghibli, and bears all the hallmarks of Miyazaki's later successes: fantastical worlds, great characters and stunning animation. A thousand years after a great war, a seaside kingdom known as the Valley of the Wind is one of the only areas which remains populated. Led by the courageous Princess Nausicaä, the people of the Valley are engaged in a constant struggle with powerful insects called ohmu, who guard a poisonous jungle that is spreading across the Earth. Nausicaä and her brave companions, together with the people of the Valley, strive to restore the bond between humanity and earth. Gorgeous. I didn't get a chance to do any comparison with my R1 DVD but everything seemed clearer with a greater depth of colour. Audio has been changed with this Blu-ray edition from Dolby Digital to LPCM but still mono, no remixing to surround. Optimum have supplied only the Japanese print, maybe that was all that was available in high definition, so there were no English or Disney credits but the English Voices were from the original Disney release. 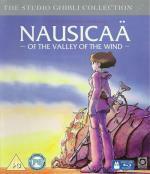 The Nausicaä of the Valley of the Wind US Blu-ray now has a release date of 8th March 2011, details here for amazon.com. 8th. March 2011 is also the day that Disney finally get to release Studio Ghibli's 2006 Tales from Earthsea DVD in the US, now that the rights to everything Earthsea have lapsed from The Sci-Fi Channel. 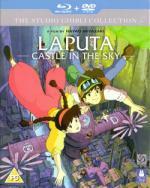 The Blu-ray releases of Laputa: Castle in the Sky and My Neighbours The Yamadas both now have a UK release date of 9th May 2011. The Blu and DVD release of The Borrower Arrietty is scheduled for 6th June 2011 in Japan, hopefully the UK/EU/US releases won't be far behind. Also the Blu release of Whisper of the Heart is set for 20th July 2011 in Japan so that ought to be out in UK later in the year and possibly also in US. So far the UK Blu's of the back catalogue have been about 5 or 6 months after the Japan release with the US release a further few months. Darn just read that the UK cinema release is this July and that the US cinema release isn't until February 2012 therefore my hoped for early release is probably not to be. Orphan Pazu's life is changed when one day the beautiful Sheeta literally falls out of the sky. Round her neck she wears a glowing crystal, a relic of the mighty Levitation Stones that once kept ancient cities floating in the air. Caught up in a race between sky pirates and sinister government agents, Pazu and Sheeta go in search of Laputa, the last of the fabled castles in the sky. Hayao Miyazaki's homage to Jules Verne and Jonathan Swift, Castle in the Sky was the first feature film from the now legendary Studio Ghibli. Combining the Japanese master director's twin obsessions of eco-thriller and aerial escapades, it crashes a treasure hunt into a fight against evil for an unforgettable adventure. Featuring the voices of Anna Paquin, James Van Der Beek and Mark Hamill. The 3rd Ghibli Blu-ray release and the 2nd gorgeous upgrade. This time the presentation from Optimum Releasing is better as there are both the Japanese and English versions of the credits depending upon the language chosen. Unfortunately the UKBlu-ray releases are region locked So, I gotta hope Disney won't take their time too much and release them at a better pace than they have so far in the future. Yes sorry that is a downside of Optimum Releasing. I will admit to surprise that Optimum/Madman are getting them before Disney unless it is because the US is region A like Japan and maybe Studio Ghibli's Japan distributors thought that the US releases would filter back too quickly to Japan. 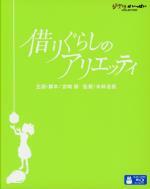 I've now ordered The Borrower Arrietty and Whisper of the Heart from CDJapan although they are a tad expensive. Apparently they are region free and I'm tempted to get them early and, if these turn out OK, I may even get the future ones early from Japan as well. A stylistic departure for Studio Ghibli, with writer-director Isao Takahata using digital production to create the feel of a moving watercolour sketch, My Neighbours The Yamadas follows the exploits of the Yamada family. Takahata charts the day-to-day life of husband and wife Takashi and Matsuko who, along with their two children, their dog, and Matsuko's live-in mother, navigate the pitfalls of modern life to often comic effect. 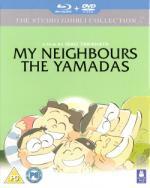 Featuring the voices of Jim Belushi, David Ogden Stiers and Molly Shannon, My Neighbours the Yamadas is a one-of-a-kind comic treat. As I said in my review of the DVD a weird film which takes some getting used to and because the colouring used is based on pastel shades with the drawings based on comic strips the upgrade to Blu-ray doesn't pop as much as Laputa: Castle in the Air. Still looks good though but maybe not an essential upgrade, also the only credits again are the Japanese ones. Another wonderful Studio Ghibli film in which Hayao Miyazaki wrote the screenplay based on Mary Norton's book The Borrowers. Although I have not read the books I had previously seen both the BBC TV series version and the John Goodman/Jim Broadbent film version and the tale told here is closer to the TV version and, from my understanding in reviews, the book rather than the film. Arriety and her family of little people live in harmony with the Human Beans, borrowing items that they need for day-to-day life. This all changes when a young boy joins the household and discovers Arriety. As with other non Miyazaki films from Studio Ghibli the detailing of the backgrounds is still good but lacks the movement of the grass, trees and clouds that Mr. Miyazaki manages to create. However because of the inherent size of the main characters the insects and similar lifeforms are excellently detailed. The music for this film is supplied a Celtic harpist Cécile Corbel who fuses the Celtic and Japanese styles. Sorry to repeat but another wonderful upgrade. I hadn't noticed it before but there was a framing error with the end titles on the R1 DVD in which a little bit of follow up action on a bridge wasn't clearly shown. That problem does not exist in this copy. I quite like the case that these Japanese Studio Ghibli Collection Blu-rays come in and if it wasn't for the price I would be sorely tempted to replace my existing UK Optimum Blu-rays. All three apparently contain English subtitles and are region free.